Truth be told, there are countless tax apps – both for iOS and Android – that individuals can rely on for an easier tax experience. Here are a few which are quite useful. The IRS is god when it comes to taxes, so why not check out their app first? IRS2Go has been around for a while, and while it may not have a lot of features, the fact that you can immediately connect to IRS, check your refunds, and receive tax tips, is something to consider. Additionally, you can request a copy of your tax record via the app. Here’s a short video explaining more. 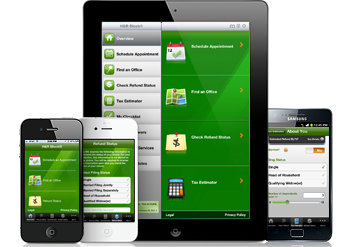 H&R Block Tax Central is one of the free tax apps available for both Android and iOS. This app has more features than the IRS app. Some highlights include the ability to estimate your taxes, track your refund status, get answers to questions, and find a tax professional. For some people, making donations is part of their routine. Whether or not the donation is deductible does not matter to them. Of course, if you can factor in your donations so that you can pay less tax, why not? One of the best tax apps in this regard is iDonatedIt. The app was created by accountants and aims to help individuals keep track of all the donations made during the year. The only drawback to this app is that you have to pay $2.99 to get it. Earned Income Tax Credit. Who would not want to qualify for it? After all, you can save up to almost $6,000 if you do. This app will help you determine if you qualify for EITC, as well as how to file your taxes.